Special thanks to Michael Rigdon for photos. Michael and Imogene are chapter leaders for Peace River. Jack and Ellen McNally are chapter leaders for Ft. Myers, Florida. 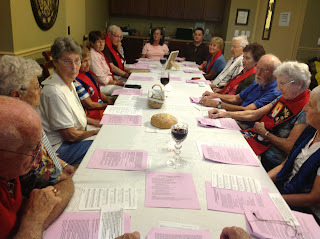 The third Saturday of each month at 4:00 P.M. in Palm Coast, Florida. Live streamed on the internet weekly to your home or wherever you are with your computer. In your home with friends. Call or e-mail requesting details. Fr. Schuller Draws a Big Crowd at Boston Talk/ "Banned by Cardinal in Boston!" Cardinal Sean O'Malley probibited Fr. Schuller, an Austrian priest leader, who publically called Roman Catholic Women Priests " a prophetic movement", from speaking on church property. Didn't Cardinal O'Malley ever hear of the famous phrase "banned in Boston"? In my view, the hierarchy and the Vatican continue to be the gift that keeps on giving! The hierarchy condemns, the people show up! Fr. Helmut Schuller Kicks Off "The Catholic Tipping Point/ Tour" by Jamie Mason/National Catholic Reporter/Roman Catholic Women Priests, said Fr. Schuller is " a prophetic movement"
Fr. Helmut Schüller should be on summer vacation right now. "We are supposed to be promoting the biblical message that men and women are made in the image of God," Schüller said. "How can we promote this message without representing it in our structures? This is not a question of the demands of modern society, but question of our original message. We must rediscover this common image for God." In Austria, reform-minded parishes have been intentional about practicing reform in the framework of their own communities. This includes allowing laypeople to offer homilies and lead communion services when parish priests are away. Catholics who are divorced and remarried outside the church are permitted to take Communion, as are Protestants. Gay and lesbian couples are also welcome in the community and to the eucharistic table. "Eucharist must not be an instrument of sanctions," Schüller said. "The highest symbol of Communion is acceptance..."
One of Schüller's deepest hopes is that the institutional church will create a system of fundamental rights for all of the baptized. "We should speak not about laypeople, but 'church citizens,' " he told the audience. "The word 'lay' suggests 'without competence or experience.' "
"The Christian understanding of human beings is that they have rights and responsibilities and a special dignity that must be respected," Schüller said. "Therefore, they are entitled to participate in the church's decision-making." "Full participation of church citizens is a question of respect for human beings," he said. "Democracy was a step forward in modern society, yet our church fought against it for centuries." Because Schüller is most interested in learning about the struggles of reform-minded Catholics in the United States, his 30-minute presentation was followed by almost one hour of dialogue with attendees. A Roman Catholic Womanpriest (RCWP), Gabriella Velardi Ward, asked Schüller what he and the Austrian Priests' Initiative thought of their movement, which began in Europe. Schüller said while his organization respects RCWP and sees it as a courageous movement, their desire is to see the whole church open up to the ordination of women, not just a small segment. "We see ourselves as walking the walk and living the change we want to see. We are going through the back door so that one day, women can go through the front door," Velardi Ward replied. Schüller, engaging in the kind of respectful listening he wants from the hierarchy, responded, "Then maybe we should respect you as a prophetic movement..."
[Jamie L. Manson is NCR books editor. She received her Master of Divinity degree from Yale Divinity School, where she studied Catholic theology and sexual ethics. It is a joy to have Fr. Schuller on this U.S. tour and to read about his dialogue with Roman Catholic Womanpriest, Gabriella Velardi Ward. Amen, our movement is leading the way toward a renewed priestly ministry in a community of equals in grasstoots, inclusive communities in more and more places in the United States. We are a "mustard seed" movement for justice for women in our church. In an article in the National Catholic Reporter, Phyllis Zagano, author of Women and Catholicism, writes: “Once a pope trashes you, it's pretty much downhill from there. So once Pope Gregory the Great in 591 declared that the "sinful" woman in Luke's Gospel who anointed Jesus' feet was Mary Magdalene, a whole industry developed to discredit her. That's big stuff. I mean, she is the one who announced the Resurrection. There's a zinger for everyone: sisters, nuns, married women, working women. OK, not quite everyone, just the female everyones. 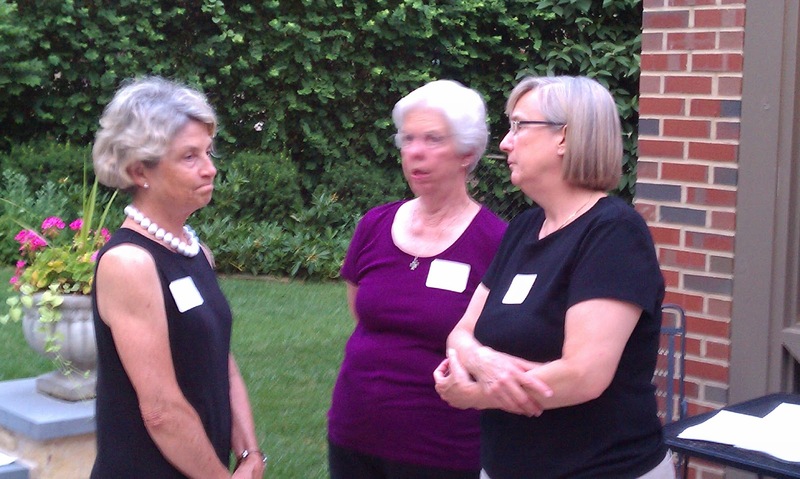 You know the litany: the LCWR thing, the birth control thing, the "radical feminist" thing. From here, it looks like half the church has been labeled reborn Magdalenes, locked out of papal offices with no way to respond, no way to react, no way out… "
In Luke 8:1-3, we learn that Jesus had male and female disciples including Mary of Magdala, Joanna , Suzanna, and many more who contributed to the support of Jesus with their own funds. Now how many sermons have you heard about the many women who bankrolled Jesus’ ministry? Imagine a church today that honored the gifts of women as spiritual equals! This is the church of our dreams that we are birthing today. The Gospel of John portrays a close relationship between Mary of Magdala and Jesus. When the other disciples come and go, Mary stays nearby, weeping, searching for clues of Jesus whereabouts. Her grief is real. She has listened to his teaching and experienced his healing love. This type of deep friendship suggests a break with the social conventions of the time. Jesus treats Mary of Magdala as an equal among the male disciples. In an age where a woman’s word was suspect, the Risen Christ calls her to be the apostle to the apostles to proclaim the good news of the Resurrection, the central belief of Christianity. History is repeating itself today in the present spiritual revolution, that is taking place in our church over the role of women. I call it a “welcome holy shakeup!” From the first ordination on the Danube of seven women, our international Roman Catholic Women Priests’ Movement has grown to over 150. According to a recent CBS/Gallup poll, 70% of Catholics support women’s ordination. In addition, 400 Austrian priests, 300 German theologians and 800 Irish priests who have endorsed women priests. This clerical rebellion really is getting everyone’s attention with major media articles! On Holy Thursday, Pope Francis washed the feet of young women and men in a juvenile detention center in Rome. This act of loving service is a spark of hope that change is in the air. Appointing women to top jobs in the Vatican would be an important step. There is certainly a long list of competent nuns and women priests who are more than willing to serve as leaders in our church! Did you see the photo of Pope Francis placing his papal skull cap on a little girl’s head in Vatican Square! A delightful encounter! Roy Bourgeois and now Msgr. Helmut Schueller from Austria are proudly challenging the old boys' club as they proclaim an agenda of church reform, including support for women priests, to large crowds in cities across the U.S. and Europe! Perhaps, we are on our way to a tipping point! Can’t you just see one day, a Vatican spokeswoman, will say: "Today we announce good news. The Church is reclaiming Jesus example and the early church tradition of women as apostles and leaders, all sacraments and all roles will be open to all the baptized! " This would come as no surprise to the early Church Fathers and Mothers! So let’s be clear, women were apostles- according to the Risen Christ, St. Paul, Church Fathers and a pope. Women apostles are affirmed in the bible and in our church’s tradition! Therefore, the church should follow the example of Jesus and treat women as equals. Scholars, like Gary Macy, in The Hidden History of Women's Ordination, present scholarly evidence of women in Holy Orders during the first twelve hundred years of the church's history. Women and men were ordained to a specific service role within the community. It was not a “magic fingers” understanding of sacraments that emerged in Middle Ages. One could say that the fact that women were ordained in our church tradition is the church's best kept secret, but NO MORE!! One of the top stories that has grabbed the headlines since April 2012 is the Nunjustice Project and the Nuns on the Bus. The Vatican’s investigation of religious orders in the United States and their hostile “take-over” of the Leadership Conference of Women Religious focused on hot button issues such as women’s ordination, reproductive healthcare and gay marriage. In response to the Vatican’s rebuke the Sisters embarked on a bus trip to nine states to showcase their ministry to the poor and disenfranchised. The nuns on the bus were greeted like rock stars everywhere they went. Most people recognize Sister Simone Campbell as one of the courageous leaders of this endeavor. According to recent reports, Pope Francis has accepted the Sacred Congregation for the Doctrine of the Faith’s (commonly referred to as the CDF) take-over of the Leadership Conference of Women Religious. However, in response to a question by the Latin American religious about a possible CDF investigation of their Orders, he gave this advice: answer the CDF’s questions, but continue your ministries. Was our new pope sending a mixed message or was his response a deliberate signal that neutralizes the contemporary inquisition wing of the Catholic Church? The Vatican’s treatment of its most loyal work force is a cause near and dear to my heart. 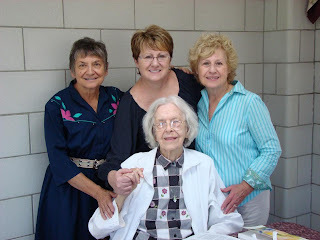 When I was 18 years old I entered a teaching order the Immaculate Heart of Mary Sisters, also known as the “Mighty Macs.” In 1995, I became a Sister for Christian Community in an independent religious order with about 500 women. We are not under Vatican control, and our mission is to live Jesus prayer, “that all may be one” by building Christian community wherever we are and with whomever we are near. I pray that one day soon, nun priests in canonical communities will bless our church! 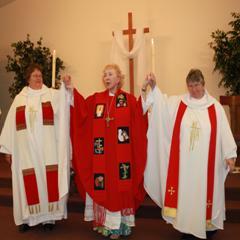 There are several Sisters for Christian Community who are Roman Catholic Women Priests. Thank God! In 1969, Pope Paul VI officially corrected Pope Gregory’s error, mis-identifying Mary of Magdala with the sinful woman in Luke 7. Can’t you just see Mary, apostle to the apostles, applauding and giving a thumbs up in heaven? In 2013, the Association of Roman Catholic Women Priests will have six ordinations: April: Louisville, KY, May:Cincinnati, Ohio, June: Falls Church, VA, Sept. Albany, New York, Oct. St. Petersburg, Fl and Dec. Louisville, Ky. Who says there is a priest shortage? Our projected number of ordinands is 14 in 2013. In the United States, there are two branches of our movement. Together we serve over 60 faith communities and we are in 30 states in U.S. Women Priests also serve inclusive communities in Europe, Canada, and South America. As part of an international Roman Catholic Women Priests Movement, the Association of Roman Catholic Women Priests is a renewed priestly ministry in a community of equals. Our specific charism within the broader RCWP movement is to live Gospel equality and justice for all in the church and in society now. We work in solidarity with the poor and marginalized for transformative justice in partnership with all believers. We proudly wave our ARCWP banner at demonstrations for peace and justice. Our vision is to live as a community of equals in decision making as an organization and within all our faith communities. In solidarity with other reform organizations, we are working to transform a hierarchical institutional church into a circular, community of equals model that reflects Jesus example of non-violence, compassion and justice in the Gospels. How can we, like St. Mary of Magdala, promote the Good News of Gospel justice, equality, and partnership rising up in our church and world? Vatican Offers "Time off Purgatory" for Followers of Pope Francis' Tweets/What's Next Email Confessions? What will the Vatican do next? Email Confessions? Gary Wills on Pope Francis: Insightful Analysis! I agree with Gary Wills that Pope Francis should not canonize John Paul 11. If Pope Francis succeeds in reforming the Vatican Curia, that will be a major accomplishment. The issue of the full equality of women in the church including ordination will not go away! The international Roman Catholic Women Priests Movement is leading the way to model a non-hierarchical, egalitarian, inclusive model that is one with the people in grassroots communities. New Catholic Reform Site: Agenda- Decentralize the Church!/Good Idea! An Inspirational Visit with Sister Adrian Hofstetter O.P. South of Louisville, KY about 60 miles is an area called "The Kentucky Holy Land", because there are 3 mother houses of religious women, and the Trappists at Gethsemane, all pretty close together. Since the early 1800's when Bishop Flaget of the Bardstown Diocese requested women to come to the area to teach and nurse the nearly all catholic population, the religious life has flourished in this area. 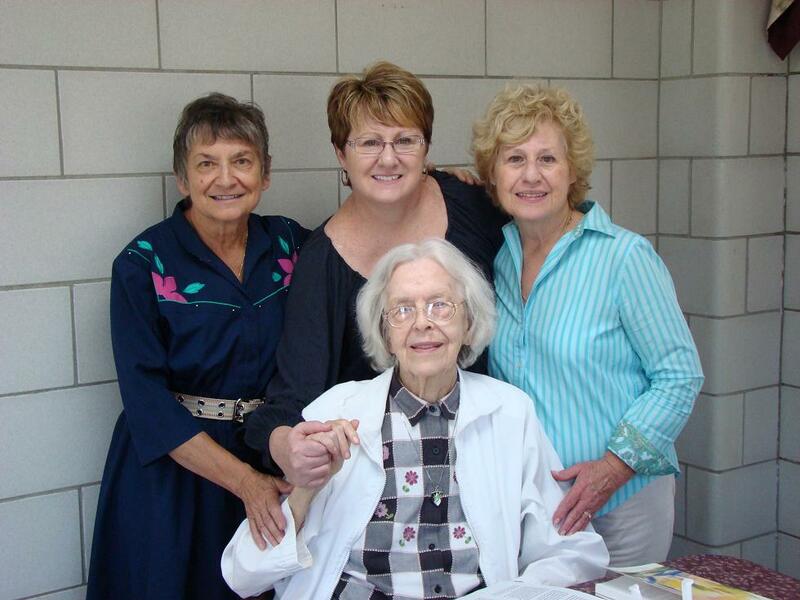 In Louisville itself we have the Ursuline Motherhouse, as well as many schools and universities dedicated to Catholic education spun off from these sisters. In Loretto, KY is the home of the Srs. of Loretto, founded by Catherine Spalding. A few miles down the road is the home of the Srs. of Charity of Nazareth. Then a few more miles and you come to Nerinx, KY where the Dominican Sisters of Peace are located and have St. Catherine's College, with about 3500 students still there. Mary Sue Barnett was employed at St. Catherine for 3 years as their pastoral minister, until the did away with the position last September. A few yeas ago, about 2008, 8 groups of Dominicans from other places merged with the Dominicans at St. Catherine's to form the Dominican Sisters of Peace. After my ordination I received an email from "Sr. Adrian Hofstetter, O.P." who is currently residing in the nursing home at the Mother House of the Dominicans. She was interested in talking about ARCWP and about the journey toward ordination. After I met Mary Sue, I told her that Adrian, one of the Dominican Sisters from St. Catherine's had been corresponding with me. Mary Sue knew Adrian and we planned to go visit her as time would allow. Since Adrian is 94, we decided to get it accomplished, and went down to visit her last Friday the 12th. Adrian, as she prefers to be called, was at the front door of the nursing home waiting to greet us! Mary Sue's mother, Barbara, went with us as well. We went to lunch, and several other of the sisters there came over and introduced themselves, as well as Adrian's 90 year old sister, who had been President of the College there for years. ...."That position—blindness to women's rights and needs—has a familiar ring. It is the same refusal to see that underlies the all-male hierarchy's ban on women priests. It is the same refusal that forbids priests to marry. Indeed, at the heart of the contraception debate and so many debates around gender in the Catholic Church is a terror that if women have rights—over their own reproductive lives, to be priests, to marry priests, to have real voice and power in the Church—then the Church men will change. And if the Church men change, then the Church will change. And if the Church changes, the future that the all-male hierarchy lives in terror of—Pope Francis's nightmare of rampaging feminists, waging a "vindictive battle," steam rolling men with their "chauvinism with skirts"—will, at last, be here. No wonder they're fighting so hard." "Thank you, from the bottom of our Kansas City hearts, for sending Janice Sevre-Duszynska, this beautiful RCWP, to be with us. On Janice's card, there is an image of an angel with a trumpet, obviously heralding a great coming. Under her name is the word "Priest," and here she was with us, Emmanuel, the Christ in our midst. We celebrated in grand style as she led us in the prayers of communion and kin-ship, women and men together, outside on a beautiful summer night for an inclusive liturgy on peace and justice. As I looked around at those gathered for this special liturgy, I knew everyone there was committed to making our world a safe and empowered one for all. Everyone had gifts. The liturgy was a celebration, not a sacrifice. No one (even those committed to resistance callings) thought of our participation (i.e., our charisms) as a sacrifice. 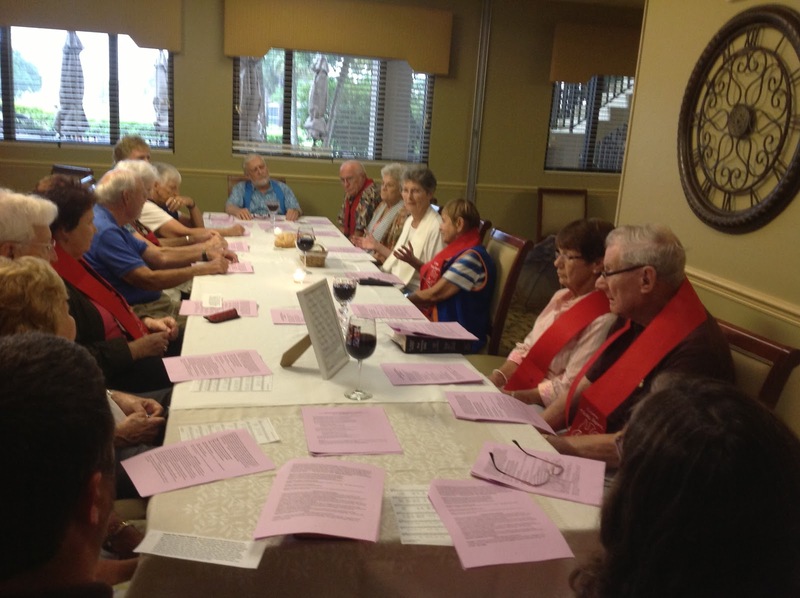 The liturgy celebrated our communion with one another and our participatory joy in creation. 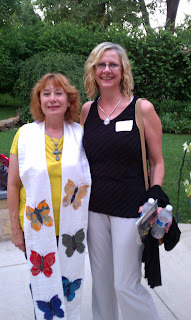 A few special memories: Janice looking beautiful in her jeans and butterfly stole, a visual image of a new paradigm for priestly ministry; our temple, the lovely home of our phenomenal hostess, Sarah Jurcyk...it was lovelier than anyone could have imagined; Janice asking for volunteers at the beginning of the liturgy to do the readings and a dancer to bring forth the book to read the gospel words (and the beautiful completion of that movement when the time came by one of the women); the RCWP banner nestled in the trees and birds singing throughout the celebration almost sounding like they were reading the words on the banner; a poignant moment when Janice asked for any remembrances of those saints who have gone before us, I heard the voice of a friend say the name of her daughter who had been brutally killed by an abusive husband and tears swelled up in my eyes; embraces, one for everyone present (approximately 45-50 people), by Janice at the sign of peace allowing this joy to spill over as everyone then took her lead and opened to the moment with others; our communion, our moment to "take and eat," and "take and drink" with ALL present, as we celebrated our common humanity and the divine Spirit within everyone and all of Creation that surrounded us in this outdoor temple; our simple, wholesome feast following the liturgy which had been graciously donated by many; our laughter; our sharing; our rekindling of friendships old and excitement of meeting new ones; our thanksgiving for this lovely gift of grace. There were many more moments, but I will conclude. The next day I took the food that was leftover, our loaves and fishes, to a shelter for abused women. The remaining drinks (water, beer, fruit juices) were given to the Peace Walk committee for the resistance work that was to take place on Saturday, July 12. This was the initial purpose of Janice's trip to KC. With all of the preparation for the resistance she had to do, it was amazing that she graciously agreed to not only visit with those of us who work for the inclusive ministry of all the beloved, but to prepare a liturgy for us. Yes, you did send us an angel. And I might add, one more heart-felt memory: when Janice said the prayers for our Pope and then our Bishop, I heard your name, my dear friend and mentor, Bishop Bridget Mary Meehan. I smiled and knew our time had come. " Watch Video of Malala Yousafzai at UN "In God we are all equal"
"William D'Antonio, a Catholic sociologist said that the percentage of Catholics who say they are "religious" has dropped from 74 to 60 percent in just the past five years. About 45-50 gathered for our first inclusive liturgy last night in Kansas City, MO at a supporter's home and outside terrace. Dee Binda organized the liturgy and her husband Bob gave a helping hand. It was a blessed event. Beforehand I explained a bit of the history of the movement, our ARCWP community and our circle of equals in a renewed priesthood in a reformed Church. We used the Liturgy for Partnership and Equality for Women in Church and Society and readings from Isaiah and Luke's Gospel of Mary's visit to Elizabeth with The Magnificat. "Blessed is she who believed that what our God said to her would be accomplished!" Elizabeth's words to Mary was the focus of the homily. The community expressed their appreciation of the inclusive language and the mutuality within our liturgy: how people read the Eucharistic prayer; how we consecrated the Eucharist together; how they read the Gospel and Old Testament reading; and the mutual blessing. They felt empowered by the liturgy they said. They felt moved when they gave each other the Eucharist saying: "You are the body of Christ." They asked if they should call me mother or another title. I said that "Janice" was fine as we do not want a hierarchy. I was asked to return again as soon as possible. I gave out Roy's new booklet "My Journey from Silence to Solidarity," the Spring SOA Watch "Presente," my card and our brochure. I have asked people who took photos to send them to Bridget Mary. Dee Binda may also write a reflection on the gathering.